Gods of the Morning follows the year through the turning of the seasons at Aigas, the Highlands estate John Lister-Kaye has transformed into a world-renowned wildlife center. John's affection, wisdom and lyricism sings off every page, bringing the natural world around him to life: from the rookery filled with twenty-nine nests and distinct bird calls to descriptions of the winter morning light, from the wood mice and the squirrels preparing for winter to tracking a fox's path through the snow. 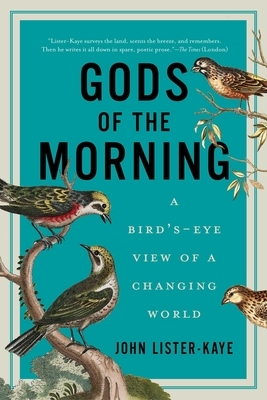 In particular it brings John's lifelong love of birds--his gods of the morning--to the fore. In the Highland glens, bird numbers plummet as their food supplies--natural fruits and every kind of creeping, crawling, slithering or flying bug--begin to disappear. Not just the swallows and house martins have vanished from round the houses. Gone are the insect snatching wheatears, whinchats and stonechats from the hills, and redstarts and flycatchers have fled the woods. Pied wagtails no longer flicker across the lawns and sandpipers and grey wagtails have deserted the river banks. Farmland and hedgerow species have vanished in the night: the linnets, yellowhammers, and all the warblers have decamped from the thickets.